Coconut Curry Sauce will challenge your tastebuds with its play of coconut, curry and black pepper. It is low-carb too! Shred ¼ green, red and yellow bell peppers. Blend ¼ red and yellow bell peppers and ½ of the chopped onions. This will be used as thickener for the Coconut Curry Sauce. Put the chicken drumettes into a clean pot and set on the stove. Add the thyme, onion powder, some salt, black pepper and half of the chopped onions. Stir over medium heat till it is well steamed. Add the coconut milk and the curry powder, cover and cook for about 3 minutes. Add the mushrooms and once it boils again, add the blended and grated peppers. Cover and once it simmers, add salt if necesary and it is ready. 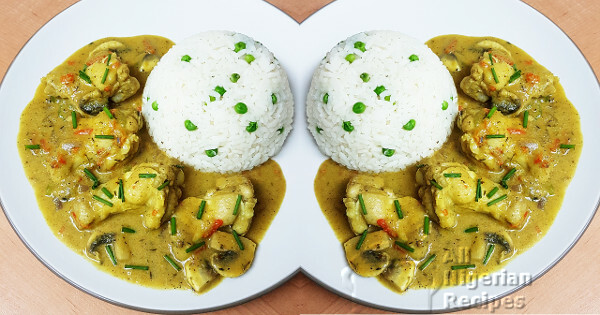 Serve with boiled white rice, boiled white coconut rice, mashed potatoes and other boiled staple foods. If you are on a low carb diet, it is quite filling and can be had as a soup on its own or eat it with boiled cauliflower rice.